*Note that we used Google Chrome version 18 to create this instructions, but the principal should be the same for all versions of Chrome. 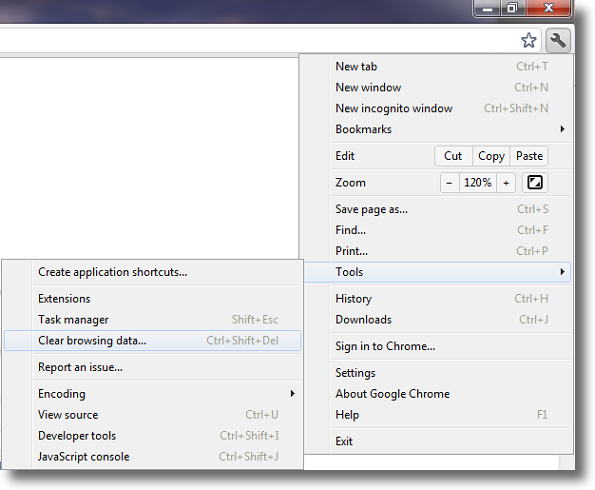 Once your browser is open, press Ctrl+Shift+Delete to open up the Clear Browsing Data window. Alternatively, you can manually go to this menu by selecting the Wrench icon (the settings menu, located in the upper-right corner) then, Tools, and Clear Browsing Data. 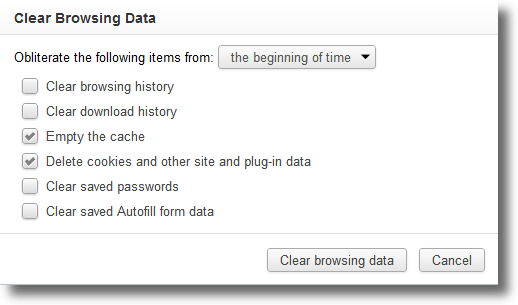 Select the Empty the cache and Delete cookies check-box. Uncheck everything else to avoid deleting data unintentionally. Your computer will work for a moment, and then the process will be complete. You've now successfully deleted all cache from Google Chrome!